There is a tremendous movement going on to bring software applications to the web, and I agree that it seems very doable and is just a matter of time. The question for Salesforce.com is what role will they play and will the proprietary Apex language win out over open source, or how will a player like Google influence the architecture for these future applications. Through the development and expansion of API’s and WebServices the likelyhood of this connected business web is really close to becoming a reality and I think we’re at a very cool turning point for software and services coming online. A Disruption At Dreamforce 2006? I attended the session, in fact I wrote about it here but I don’t recall any “disruption”. The only thing I can figure is that because it was such a small crowd that the moderator presented in a more casual setting and just talked to us from the floor rather than from the stage and they were unable to record the session because of it. They must think that since there was no recording the session didn’t take place. It’s nice to see that if a disruption had actually occurred they cared enough to send an apology. Nice touch – I’m impressed, and thanks for the latte’. Its been a year since Salesforce launched the AppExchange, and it seems like they are at a turning point with the platform. What is the vision for the AppExchange? If Mr. Benioff truly envisions it as the “eBay for the business web”, then they must make it easy and cost effective for people to build and profit from it while also making it compelling for people to consume the applications. Salesforce.com fixed the button issue back in March. If you previously changed your IE6 cache settings from the default (Automatically) and you just upgraded to IE7, the IE6 CSS might be cached. Try logging in and hiting Ctrl-F5 for a full refresh. Or clear the cache and log in again. Or wait 24 hours. I’m on the latest IE7 release candidate and see the buttons fine. Douglas Karr reports problems with Internet Explorer not playing well with Salesforce.com. Who is the World’s Most Popular CRM? 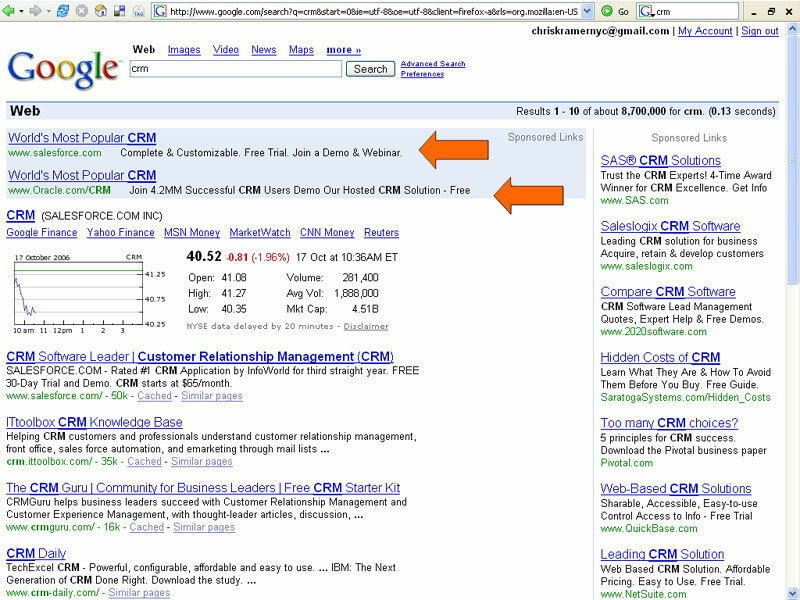 Came across these ads in Google – both Oracle and Salesforce.com believe they are “World’s Most Popular”, although Oracle goes another step to quote their massive subscriber number at 4.2 million which is more than 8x the 510,000 that Salesforce promotes on their homepage. In my synopsis of Dreamforce Day 4, I mentioned a breakout session called “Business Mashups” – the video of that session has been posted to the videos page here and also on the successforce blog. At the end of that session someone in the audience asked if there was a place on the web that had a directory of companies that offer webservices and APIs which nobody could recall. I’m not sure if this is what the panelists were thinking of, but I found a great site called ProgrammableWeb.com that has quite a robust directory of APIs and already built mashups. Not surprisingly, Google Maps is leading the pack with the most mashups, and 6 related to Salesforce.com are currently listed.